In November 2014, while testifying before the Senate Committee on National Security and Defence, I raised the issue of Islamic clerics using mosque sermons to attack the foundational principles of Western civilization and liberal secular democracy. Liberal Senator Grant Mitchell was outraged by my testimony that at most Canadian mosques, the Friday congregation includes a ritual prayer asking, "Allah to give victory to Muslims over the 'Kufaar' (non-Muslims)." In a heated exchange with me, the senator suggested I wasn't telling the truth, implying I was motivated by Islamophobia. Sadly, Sen. Mitchell is not alone in such views. But neither is there any let-up in the attacks on Canadian values emanating from many mosque pulpits and Islamic conferences hosted by radical Islamist groups. For example, in a sermon on Friday, May 6, delivered at a mosque in Edmonton, an imam invoked the memory of Prophet Muhammad to whip up hatred against Israel. He declared peace accords with Israel are "useless garbage" and vowed that Jerusalem will be conquered "through blood." Attacks on Canadian values frequently emanate from mosques and conferences hosted by radical Islamist groups. In February, the same cleric predicted Islam would soon conquer Rome, "the heart of the Christian state." The Edmonton mosque diatribe was not isolated. On May 13, just north of Toronto, an Islamic society hosted a celebration of Iranian mass murderer, Ayatollah Khomeini. The poster promoting the event described Khomeini as a, "Liberator and Reformer of the Masses." 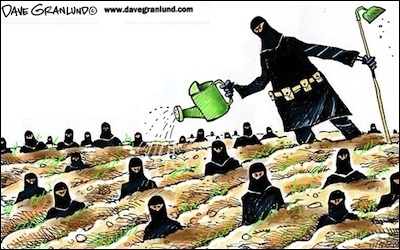 On Saturday, the Islamist group Hizb-ut-Tahrir, banned in some countries, hosted a conference to discuss the re-establishment of a global Islamic caliphate. Pakistan-Canadian writer Tahir Gora went to cover the event, but was barred from entering the hall. "They said this was a closed door, in-camera meeting for our supporters," Gora told me after he was asked to leave. 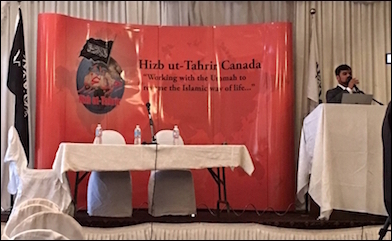 A speaker addresses the Hizb-ut-Tahrir conference in Mississauga, Ontario, on May 21. Fortunately, one Palestinian-Canadian woman was able to enter the event. She shared with me some of the proceedings from inside the gathering. "I walked into the banquet hall with approximately 100 attendees who were gender segregated. I sat next to a woman who said she had been in Canada for 40 years." When I asked her if she felt any disconnect between enjoying 40 years of democracy, yet supporting the Hizb-ut-Tahrir who wanted to end it, she explained that democracy has done nothing good to people, so she and other believers follow Allah's rule. "The first speaker reminded Muslims that they are obligated to implement Allah's orders that fulfil the Islamic State. It is "not permissible for us to choose' he said, citing the Quran. However, he said it was necessary to win the public's hearts and minds; and to partner with people of power, citing examples from the life of the Prophet." "At the end, a three-minute video was presented to demonstrate the collective oil and natural gas production capabilities of the Muslim world, the human capital needed to mine and process these resources ... the military power required to protect them and the types of weapons needed to make such a military effective." While this was unfolding we received news that the Trudeau government, as part of its infrastructure development program, had authorised a $200,000 grant to a southern Ontario mosque with links to the Muslim Brotherhood. Which begs the question: Who's minding the store?